Yellow billed, white-tailed tropic bird, not indigenous but native to Bermuda. It is a national symbol and many souvenirs and pieces of jewelry are made with its image, some locally in gold and silver. 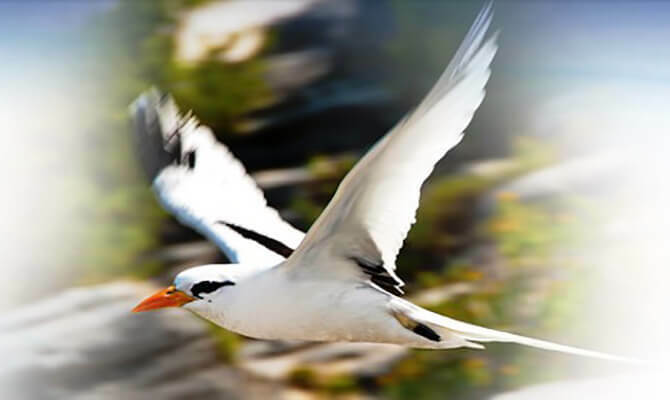 The white-tailed tropic bird – or longtail as Bermudians know it – is Bermuda’s traditional harbinger of spring and one of the most beautiful features of our coastline during the summer months. Nesting from April to October in holes and crevices of the coastal cliffs and islands – mostly in the Castle Harbour islands – where it is safer from human disturbance and introduced mammal predators, it is the only native seabird to have survived in numbers comparable to its primeval abundance on Bermuda. Once, up to about 1978, at least 3,000 nesting pairs used to breed along most of the coastline but the numbers have declined steadily due to coastline development, increased disturbance from an expanding population, and predation by illegal-stray dogs, cats, crows and oil pollution at sea. Also, they compete with pigeons for nests. Other factors include global warming and its higher sea levels that flood lower nest sites. Hurricanes Felix and Adrian in September 2004 destroyed many nests and filled others with rock, suffice to say, there is a longtail housing crisis. To try to solve the problem of weather, nature and global warming, longtail igloos were invented in 1997 as an emergency measure to provide alternative nesting sites. They are made of SKB roofing material and provide good insulation and shelter from the sun. They are light but strong with a concrete covering that provides camouflage and holds the nest in place. Thirty-five longtail igloos are now in place on Nonsuch Island and seem to be working well. Longtails have such small feet that they are unable to walk on land and hence do all their nest searching on the wing. It is this constant searching back and forth along the cliffs, combined with their aerial courtship display, which involves touching the tips of the long tail feathers together in paired flight, that makes them so conspicuous on our coastline. The single purplish-red speckled egg is laid in April and hatches in late May. The chick takes approximately 65 days to fledge and departs to sea on its own in late July or early August. Longtails do all of their feeding far out on the open ocean where they plunge from a height onto unsuspecting fish and squid like a gannet. During the winter months, the population disperses throughout the Sargasso Sea and remains out of sight of land. Evidently, the birds sleep on the wing or on the water if it is calm. 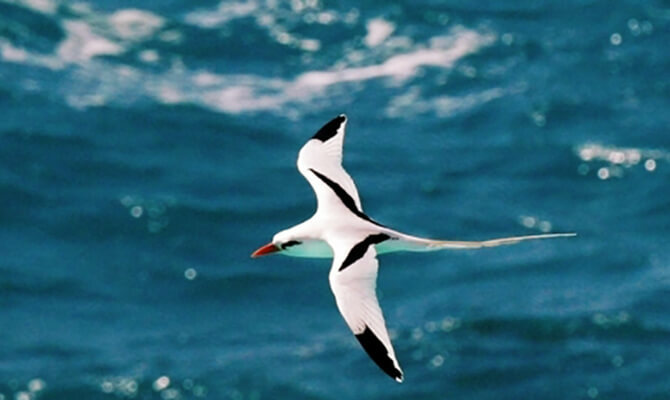 Contrary to popular belief, the Bermuda Longtail is not the National Bird. Because of its perseverance, strength and endurance, the Cahow is believed to have been in Bermuda for 300,000 years and covets the title. Long thought to be extinct, wiped out by early 17h century colonists, until re-discovered 300 years later, the Cahow is rare and protected. Heard only during the winter months, the cahow earned its Christmas bird name from mariners who became involuntary early temporary colonists after their ships going elsewhere were damaged on the reefs. It is said that they were so frightened by the nocturnal cries of this once abundant bird that they referred to Bermuda as the Isles of Devils. When the first settlers arrived in 1609 and 1612, it is believed there were half a million cahows. They were so easy to catch and eat they were hunted to what was thought to be extinction. In 1951, Dr. Cushman Murphy of the USA finally arrived in Bermuda from a museum in New York City, after having been pestered for years by Samuel Ristich to do so. Ristich had served in Bermuda with the US Army Air Corps and had found a cahow. When Murphy came down, he found five living cahows, believed to have been extinct since 1650. As a direct result of Murphy’s visit and unique find, Dr. David Wingate started his breeding program for cahows on Nonsuch Island shortly afterwards. Dr. David Wingate discovered 16 pairs still living on Nonsuch Island in 1951. In 2002, more than 65 breeding pairs were identified. 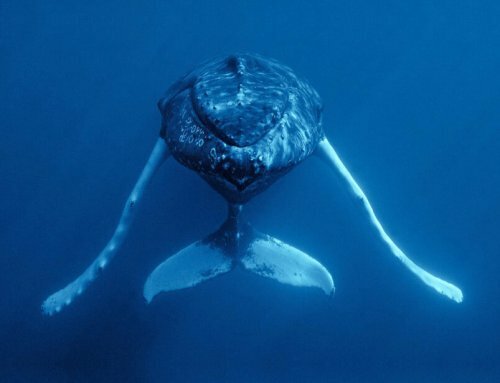 They fly over the sea but return to Bermuda to begin courtship activities in late October. They mate for life and produce only one egg each year. The female lays a single white egg in January and in early March a chick covered in dense grey down emerges. Young chicks leave Bermuda in late May or early June and spend their first eight years of life on the open ocean before returning as adults to breed. Like most petrels, cahows are nocturnal and land only to breed. They nest in a soil burrow the bird excavates.